We bring forth our vast industrial experience and expertise in this business, instrumental in providing Dehydrated Green Peppercorn. Green pepper corns are picked while the berries still unripe and green in color. Green pepper is obtained just like the black ones. But the green colour is retained by treating with Sulphur dioxide or freeze-drying. We are a well-known enterprise that has introduced an unadulterated variety of Green Peppercorn that is sourced from our authentic vendor base. The product is processed by food experts under hygienic conditions. We are the leading organization engaged in offering a wide range of Green Peppercorn. 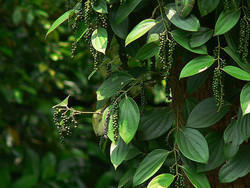 The Green Peppercorns offered by us are especially cultivated in the southern part of India. 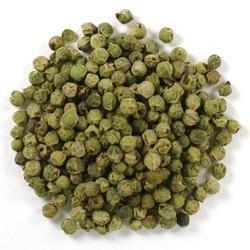 These Green Peppercorns are highly demanded for using in making delicious and yummy food. We provide premium quality of Whole Spices, Powdered Spices, Seeds and some of Dairy products too. Being the leaders in the market, we are offering Green Peppercorn Cold Cuts. Our offered range is processed under the vigilance of accomplished team using advanced methods. - With an aim to become leading firm in this domain, we have been affianced in supplying a high grade Green Dehydrated Pepper. Being a well-distinguished company in the market, we are into offering Green Peppercorn Seeds. Green peppercorns are unripe pepper berries that are harvested from the same tropical vine that produces both black and white peppercorns. They are classified according to the way they are processed: dried, freeze dried and brined. Green Pepper corns are the immature, fresh (green) berries of the pepper vine Pipernigrum. These berries are plucked fresh from the vines and processed into various speciality products while retaining their natural green colour and flavour. We are a top notch supplier of Green Peppercorn. Avail from us, Dehydrated Green Pepper that is hygienically processed in the units. Our Dehydrated Green Pepper well sorted and cleaned under the supervision of our experts. Moreover, Dehydrated Green Pepper has a large demand in the food processing industry.